The Special Skills Acting Resume is typically what someone with little to no experience will tend to use or by those with a hard to find or master skill (i.e. you can ride a unicycle on a tightrope). It is also perfect for beginner actors with skills because without much previous acting experience they must draw on attractive facets of their life experience. This is commonplace and expected, after all everyone has to start somewhere in the ‘biz’ but everyone is held to the same standards as well. This means that you, too, must have a resume with the appropriate sections delivering essential information regarding your strengths and knowledge. Step 1. Enter your name at the top of the page in the center. Make sure it is a larger font than the rest of the page. Your contact information or your agent’s contact information should go below your name. Step 2. Enter your Height, Weight, Hair Color, and Eye Color in the next section. Step 3. Your experience should go in the next section. Each media experience will have its own section. The individual media sections are Film, TV, Theater, Web Series, and Commercials. There should be three columns within each section. 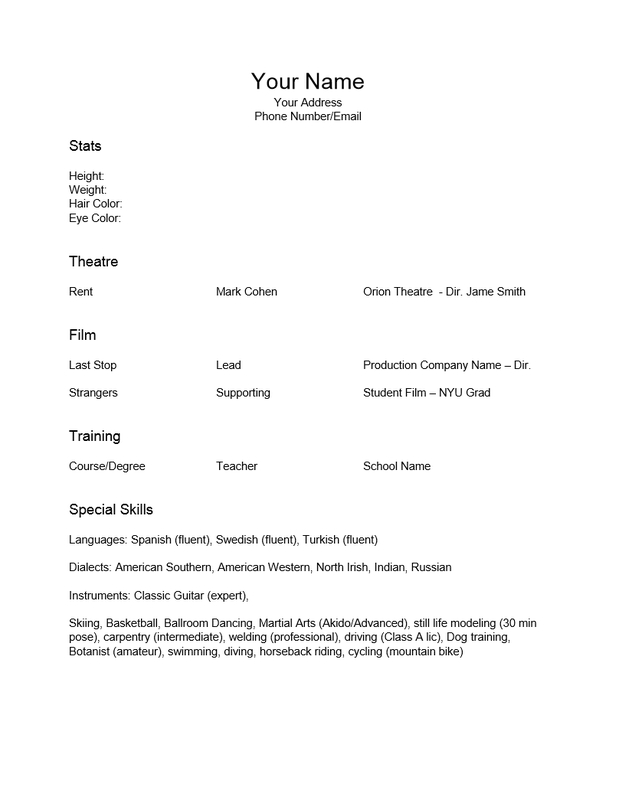 The first column should have the Name of the Production, the second column should be the role type or role you played, the third should be the name of the director or production company. Step 4. The Training Section must also have its information divided into three columns. In the first column, enter the degree/diploma/certificate/course. The second columns should contain the name of the teacher while the third should give the name of the school. Step 5. The Skills section is the next section. This will be the main course of the Skills Acting resume and should include as many skills as you possess. It is important to keep this resume readable so if you have a lot of skills use a 12 point standard font for the whole resume (but make your name larger). If there is a particular category that is specific (i.e. foreign languages) you should separate it and call attention to it with a sub-heading.